Tickets on sale Friday, June 20 at 10:00 a.m. local time in each market. A six-time Grammy winner, Emmy Winner, humanitarian, singer, songwriter and producer, Ziggy Marley has released twelve albums to much critical acclaim. His early immersion in music came at age ten when he sat in on recording sessions with his father, Bob Marley. As front man to Ziggy Marley and The Melody Makers, the group released eight best-selling albums that garnered three Grammys, with such chart-topping hits as Look Who’s Dancing, Tomorrow People and Tumbling Down. Ziggy’s first solo album, Dragonfly (RCA Records), was released in 2003. His second solo release, Love is My Religion (Tuff Gong Worldwide), won a Grammy in 2006 for Best Reggae Album. His third solo album, Family Time (Tuff Gong Worldwide), scored him a 5th Grammy award for Best Children’s Album. Equally ambitious in its lyrical themes taken from Ziggy’s own life experiences and emotions Fly Rasta is a call to empowerment, enlightenment, freedom and, as with many of Ziggy’s songs, the higher power of love. It’s also a call to action for the planet Earth. A packet of wildflowers is included in every CD, encouraging fans to connect with nature and grow something beautiful. Ziggy is also partnering with several environmental organizations, including COTAP (Carbon Offsets To Alleviate Poverty), which will assist in offsetting the “carbon footprint” of his upcoming world tour. To coincide with the release of Fly Rasta, Ziggy has put out his debut children’s book I Love You Too, a coproduction of Akashic Books and Tuff Gong Worldwide. The multicultural picture book is based on one of Ziggy’s most beloved songs of the same title from his Grammy Award-winning album Family Time, which explores a child’s relationship with parents, nature and the unstoppable force of love. 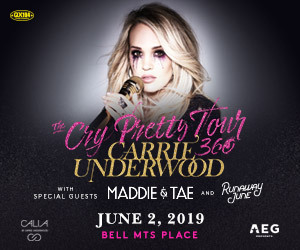 Tickets for the Winnipeg date available online at www.ticketmaster.ca, by phone at 1-855-985-5000, or in person at all Ticketmaster outlets. For more information on Ziggy Marley, visit www.ziggymarley.com.